A dab of apricot preserves gives these buttery brown sugar thumbprint cookies an extra special look, and they are surprisingly easy to prepare and bake. Add these cookies to your holiday baking list or make them for a tea time treat. 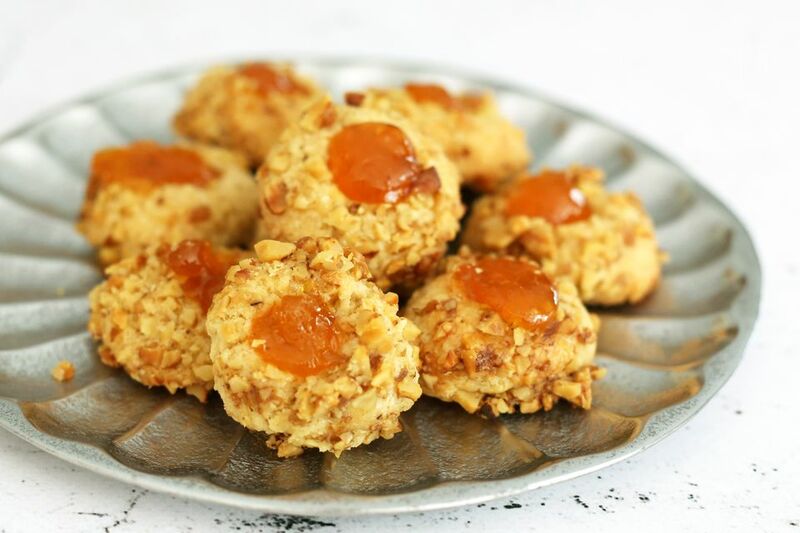 Use peach or apricot preserves or your own favorite preserves in these easy cookies. Feel free to coat the cookies with chopped pecans or almonds instead of walnuts. In a mixing bowl with an electric mixer, beat the butter and brown sugar until fluffy. Add the egg yolk and 1 teaspoon of vanilla; beat until smooth and well blended. Stir the flour into the batter just until blended. Cover and refrigerate for 30 to 45 minutes. Whisk the egg white or beat with a fork just until just slightly foamy. Roll the dough into small balls, about 1/2-inch in diameter. Dip the dough into the slightly beaten egg white and then roll in the chopped walnuts. Place the cookie dough balls on ungreased baking sheets, leaving about 1 inch between each cookie. With a thumb, press each cookie to make an indention in the center. Drop about 1/8 teaspoon of jam into the indentation of each cookie. Let the cookies cool completely. For the optional icing, combine the powdered sugar with water and 1/2 teaspoon of vanilla extract. Drizzle over the cooled cookies.